Own Boat Tuition by Haslar Sea School is able to provide Instructors for all levels of Sail Cruising Training, on your own boat. We can offer the full range of RYA Courses, including Helmsman’s, Day Skipper, Coastal Skipper, and Yachtmaster Coastal and Offshore Preparations. We are happy to arrange custom tuition timings including half days, evenings, and spreading training over a number of days/weeks. We can also arrange RYA Examiners if you are looking to take an exam, either on their own, or as an addition to one of our courses. We can also offer non RYA training, providing whatever training you feel you require, with whichever topics you would like our experienced instructors to cover. 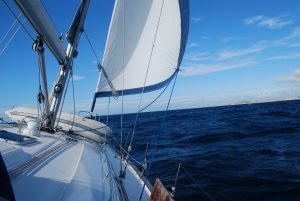 This has included spending a couple of days on board yachts with the owners spouse and friends, who don’t normally take an active role skippering the boat, but would like to be more helpful on board, and have some knowledge in case all goes wrong! It could be that you’ve just bought a new boat, and would like some handling tips and techniques to get past any unfamiliarity’s, or perhaps you want an Instructor to accompany you on your first long passage or delivery trip? Whatever your requirements we are sure we can provide something suitable.